This is not a question about catch-all queries that accept user input or use variables. This is strictly about queries where ISNULL() is used in the WHERE clause to replace NULL values with a canary value for comparison to a predicate, and different ways to rewrite those queries to be SARGable in SQL Server. Our example query is against a local copy of the Stack Overflow database on SQL Server 2016, and looks for users with a NULL age, or an age < 18. The query plan shows a Scan of a quite thoughtful nonclustered index. The scan operator shows (thanks to additions to actual execution plan XML in more recent versions of SQL Server) that we read every stinkin' row. Table 'Users'. Scan count 1, logical reads 9157, physical reads 0, read-ahead reads 0, lob logical reads 0, lob physical reads 0, lob read-ahead reads 0. CPU time = 485 ms,  elapsed time = 483 ms. The question: What are ways to rewrite this query to make it more efficient, and perhaps even SARGable? Feel free to offer other suggestions. I don't think my answer is necessarily the answer, and there are enough smart people out there to come up with alternatives that may be better. If you want to play along on your own computer, head over here to download the SO database. There are various ways to rewrite this using different T-SQL constructs. We'll look at the pros and cons and do an overall comparison below. Using OR gives us a more efficient Seek plan, which reads the exact number of rows we need, however it adds what the technical world calls a whole mess of malarkey to the query plan. Table 'Users'. Scan count 2, logical reads 8233, physical reads 0, read-ahead reads 0, lob logical reads 0, lob physical reads 0, lob read-ahead reads 0. CPU time = 469 ms,  elapsed time = 473 ms. This yields the same type of plan, with far less malarkey, and a more apparent degree of honesty about how many times the index was seeked (sought?) into. It does the same amount of reads (8233) as the OR query, but shaves about 100ms of CPU time off. CPU time = 313 ms,  elapsed time = 315 ms. However, you have to be really careful here, because if this plan attempts to go parallel, the two separate COUNT operations will be serialized, because they're each considered a global scalar aggregate. If we force a parallel plan using Trace Flag 8649, the problem becomes obvious. This can be avoided by changing our query slightly. Now both nodes performing a Seek are fully parallelized until we hit the concatenation operator. For what it's worth, the fully parallel version has some good benefit. At the cost of about 100 more reads, and about 90ms of additional CPU time, the elapsed time shrinks to 93ms. Table 'Users'. Scan count 12, logical reads 8317, physical reads 0, read-ahead reads 0, lob logical reads 0, lob physical reads 0, lob read-ahead reads 0. CPU time = 500 ms,  elapsed time = 93 ms.
What about CROSS APPLY? No answer is complete without the magic of CROSS APPLY! Unfortunately, we run into more problems with COUNT. This plan is horrible. This is the kind of plan you end up with when you show up last to St. Patrick's Day. Though nicely parallel, for some reason it's scanning the PK/CX. Ew. The plan has a cost of 2198 query bucks. Table 'Users'. Scan count 7, logical reads 31676233, physical reads 0, read-ahead reads 0, lob logical reads 0, lob physical reads 0, lob read-ahead reads 0. CPU time = 29532 ms,  elapsed time = 5828 ms. Which is a weird choice, because if we force it to use the nonclustered index, the cost drops rather significantly to 1798 query bucks. Hey, seeks! Check you out over there. Also note that with the magic of CROSS APPLY, we don't need to do anything goofy to have a mostly fully parallel plan. Table 'Users'. Scan count 5277838, logical reads 31685303, physical reads 0, read-ahead reads 0, lob logical reads 0, lob physical reads 0, lob read-ahead reads 0. CPU time = 27625 ms,  elapsed time = 4909 ms.
Cross apply does end up faring better without the COUNT stuff in there. The plan looks good, but the reads and CPU aren't an improvement. Table 'Users'. Scan count 20, logical reads 17564, physical reads 0, read-ahead reads 0, lob logical reads 0, lob physical reads 0, lob read-ahead reads 0. CPU time = 4844 ms,  elapsed time = 863 ms.
Rewriting the cross apply to be a derived join results in the exact same everything. I'm not going to re-post the query plan and stats info -- they really didn't change. Relational Algebra: To be thorough, and to keep Joe Celko from haunting my dreams, we need to at least try some weird relational stuff. Here goes nothin'! CPU time = 1094 ms,  elapsed time = 1090 ms.
Table 'Users'. Scan count 7, logical reads 9247, physical reads 0, read-ahead reads 0, lob logical reads 0, lob physical reads 0, lob read-ahead reads 0. CPU time = 2126 ms,  elapsed time = 376 ms. There may be other ways to write these, but I'll leave that up to people who perhaps use EXCEPT and INTERSECT more often than I do. If you really just need a count I use COUNT in my queries as a bit of shorthand (read: I'm too lazy to come up with more involved scenarios sometimes). If you just need a count, you can use a CASE expression to do just about the same thing. These both get the same plan and have the same CPU and read characteristics. CPU time = 719 ms,  elapsed time = 719 ms. The winner? In my tests, the forced parallel plan with SUM over a derived table performed the best. And yeah, many of these queries could have been assisted by adding a couple filtered indexes to account for both predicates, but I wanted to leave some experimentation to others. I wasn't game to restore a 110 GB database for just one table so I created my own data. The age distributions should match what's on Stack Overflow but obviously the table itself won't match. I don't think that it's too much of an issue because the queries are going to hit indexes anyway. I'm testing on a 4 CPU computer with SQL Server 2016 SP1. One thing to note is that for queries that finish this quickly it's important not to include the actual execution plan. That can slow things down quite a bit. I'm not immediately able to explain why it's that bad, but it's not clear why we want to force nearly every operator in the query plan to go parallel. In the original plan we have a serial zone that finds all rows with AGE < 18. There are only a few thousand rows. On my machine I get 9 logical reads for that part of the query and 9 ms of reported CPU time and elapsed time. There's also a serial zone for the global aggregate for the rows with AGE IS NULL but that only processes one row per DOP. On my machine this is just four rows. My takeaway is that it's most important to optimize the part of the query that finds rows with a NULL for Age because there are millions of those rows. I wasn't able to create an index with less pages that covered the data than a simple page-compressed one on the column. I assume that there's a minimum index size per row or that a lot of the index space cannot be avoided with the tricks that I tried. So if we're stuck with about the same number of logical reads to get the data then the only way to make it faster is to make the query more parallel, but this needs to be done in a different way than Erik's query that used TF 8649. In the query above we have a ratio of 3.62 for CPU time to elapsed time which is pretty good. The ideal would be a ratio of 4.0 on my machine. Index scan is one of the few operators that can be implemented in parallel and we can't do anything about how the rows are distributed to threads. There's an element of chance to it as well but pretty consistently I saw one underworked thread. One way to work around this is to do parallelism the hard way: on the inner part of a nested loop join. Anything on the inner part of a nested loop will be implemented in a serial way but many serial threads can run concurrently. As long as we get a favorable parallel distribution method (such as round robin), we can control exactly how many rows are sent to each thread. I'm not quite sure why four separate indexes is a little faster than one index but that's one what I found in my testing. Although I don't have a local copy of the Stack Overflow database, I was able to try out a couple of queries. My thought was to get a count of users from a system catalog view (as opposed to directly getting a count of rows from the underlying table). Then get a count of rows that do (or maybe do not) match Erik's criteria, and do some simple math. --Erik's query From initial question. Table 'Users'. Scan count 17, logical reads 201567, physical reads 0, read-ahead reads 2740, lob logical reads 0, lob physical reads 0, lob read-ahead reads 0. SQL Server Execution Times: CPU time = 1829 ms, elapsed time = 296 ms.
Table 'Users'. Scan count 17, logical reads 201567, physical reads 0, read-ahead reads 0, lob logical reads 0, lob physical reads 0, lob read-ahead reads 0. 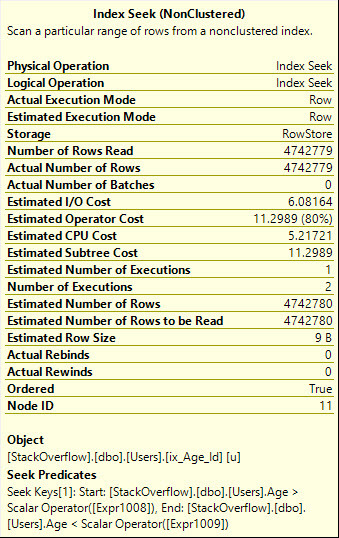 SQL Server Execution Times: CPU time = 2500 ms, elapsed time = 147 ms.
--Erik's derived tables/UNION ALL query. Table 'Users'. Scan count 34, logical reads 403134, physical reads 0, read-ahead reads 0, lob logical reads 0, lob physical reads 0, lob read-ahead reads 0. SQL Server Execution Times: CPU time = 3156 ms, elapsed time = 215 ms. This was slower than all of Erik's queries I listed here...at least in terms of elapsed time. Table 'Worktable'. Scan count 0, logical reads 0, physical reads 0, read-ahead reads 0, lob logical reads 0, lob physical reads 0, lob read-ahead reads 0. Table 'sysrowsets'. Scan count 2, logical reads 10, physical reads 0, read-ahead reads 0, lob logical reads 0, lob physical reads 0, lob read-ahead reads 0. Table 'sysschobjs'. Scan count 1, logical reads 4, physical reads 0, read-ahead reads 0, lob logical reads 0, lob physical reads 0, lob read-ahead reads 0. Table 'Users'. Scan count 1, logical reads 201567, physical reads 0, read-ahead reads 0, lob logical reads 0, lob physical reads 0, lob read-ahead reads 0. 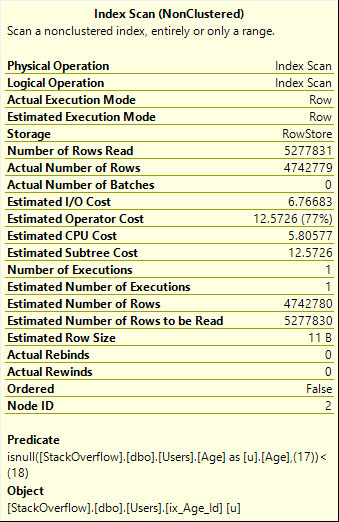 SQL Server Execution Times: CPU time = 593 ms, elapsed time = 598 ms. Here I opted for a variable to store the total number of users (instead of a sub-query). The scan count increased from 1 to 17 compared to the 1st attempt. Logical reads stayed the same. However, elapsed time dropped considerably. SQL Server Execution Times: CPU time = 0 ms, elapsed time = 0 ms. Table 'Worktable'. Scan count 0, logical reads 0, physical reads 0, read-ahead reads 0, lob logical reads 0, lob physical reads 0, lob read-ahead reads 0. Table 'sysrowsets'. Scan count 2, logical reads 10, physical reads 0, read-ahead reads 0, lob logical reads 0, lob physical reads 0, lob read-ahead reads 0. Table 'sysschobjs'. Scan count 1, logical reads 4, physical reads 0, read-ahead reads 0, lob logical reads 0, lob physical reads 0, lob read-ahead reads 0. SQL Server Execution Times: CPU time = 1471 ms, elapsed time = 98 ms. User 'STACKEXCHANGE\svc_sede' does not have permission to run DBCC TRACEON. CPU time = 2344 ms,  elapsed time = 166 ms.
Why does query runtime dramatically increase when made into subquery?